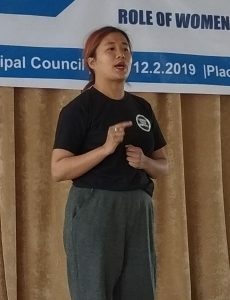 Alice Kamei speaks during a seminar that was conducted to promote responsible waste management, in Kohima on February 12. Kohima, Feb. 12 (EMN): A seminar to discuss plastic pollution and its harmful effects, and the role women can play in managing waste, was organised by a community organisation, Angamimiapfü Mechü Krotho (AMK), in Kohima on February 12. The programme was sponsored by the Kohima Municipal Council (KMC). The office secretary of the council, Zakie Kiso offered updates about the capital town’s waste output. He said Kohima town generates about 70-80 metric ton of waste daily. The number is roughly about 40-45 trips daily. According to data from the State Investment Programme Management and Implementation Unit, the waste is found to be 80 % dry, and 20% wet. In his presentation and visual representations, Kiso pointed out that most of the dry waste is plastic materials including bags, paper, glass, plastic cups, plates, mineral water bottles, Styrofoam, thermo coal products etc. He added that it takes the labourers at least six hours to segregate the wet waste from dry waste. He appealed to citizens to segregate the waste at home itself. Further, Kiso pointed out various challenges in the face of the council: citizens’ unregulated waste disposal time, lack on basic waste management knowledge; un-segregated waste at households; disposal of waste in non-bio-degradable plastic bags amounting to 40-50 thousand bags per day; improper waste disposal practices; fund constraints; traffic jams; burning of waste by public at collection points/installed bins; floating population from neighbouring villages/towns etc. Alice Kamei of a group called Green Team Kohima spoke on the topic ‘role of women in waste management.’ She said that the participation of women is important. ‘Waste starts from households and women play a vital role in managing them. In fact it is the duty of the mothers to learn to segregate dry and wet waste, she said. Kamei urged them to take carry bags when shopping, as that can help a lot in beating plastic pollution. Achieving a plastic-free environment depends largely on women, she said. Founding member of Green Team, Thangi Mannen gave a presentation on ‘plastic pollution and its harmful effects.’ Mannen highlighted the hazardous impact of plastic pollution including air pollution, groundwater pollution; its threat to wildlife, food, and human health. The effect of plastic on human health can also lead to cancer, endocrine problem, skin disease, and disruption in sexual fertility etc. “No amount of governmental policies will effectively make a difference unless people who create demand for plastic consciously choose to adapt to plastic-free lifestyles,” Mannen said. She added that one should not always wait for government directives, but make one’s voice be heard by the government for it to act upon. She urged the people to cooperate in reducing plastic pollution by making small personal changes in their day-to-day lives.